February 15th – The new Exhibitors Application Form will be available on this page. May 1st – Applicants will be notified by email. Anon – “Building could’ve done with air con on Sunday as it got very warm due to the sunny day which probably explained why the footfall was down from the busy Sunday of last year, also could you get a proper coffee machine”. The organisers of the AAF, GM Events Ltd, welcome applications from galleries, art organisations, print studios and professional artists. Exhibition stand prices start from £850 plus vat. We would like to bring to your attention the events terms and conditions below. 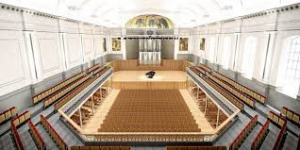 AAF celebrates its ninth year with a return to the Aberdeen Music Hall the stunning landmark city centre venue that has just re-opened following a three year closure and £9 million pound transformation. 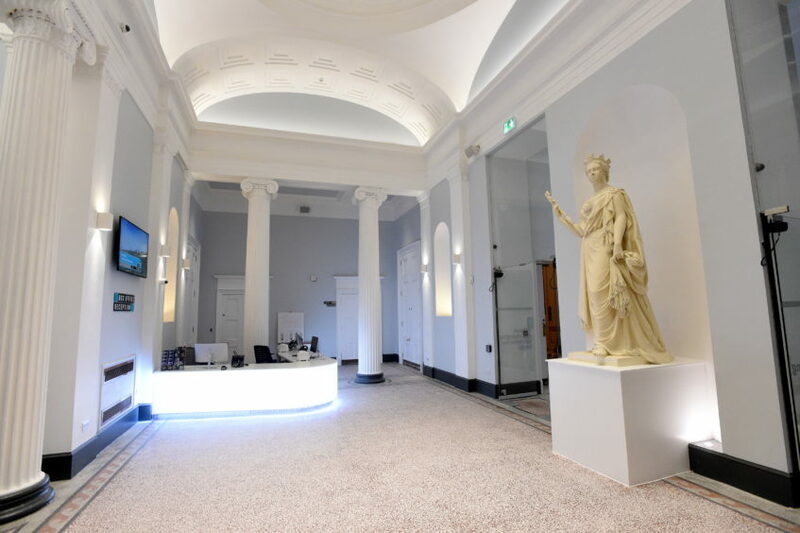 Extensive work on the 200 year old building includes new and larger exhibition space, creative learning studio, cafe bar, improved access, a superb new entrance area plus many new features. 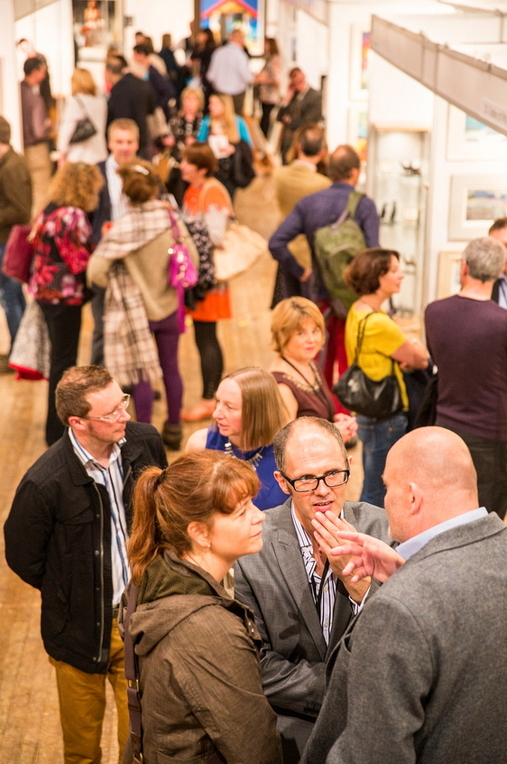 Aberdeen Art Fair is an annual event established in 2011 by GM Events Ltd. This welcome addition to the flourishing Scottish arts scene will once again bring together a wonderful range of of galleries and artists from across Scotland and the UK. The art fair opens on a Friday with a sell-out Preview Evening that offers live music, plenty of bubbly and a truly friendly atmosphere that’s not to be missed. This is followed by the Saturday and Sunday Public Open Days which has seen visitor numbers and sales go each year from strength to strength. Applications are invited from art galleries, professional artists, print studios and art collectives. We will require to see 6 samples of the art similar to those in style that you wish to exhibit at the event. To ensure a variety and broad range of art is on offer each new exhibitor is subject to the same selection process. The Exhibitors Application Form can be found below along with the events terms and conditions and FAQs. We welcome applications from printmakers and print studios. Gallery lighting, individual power supply, chairs and table (the table is 4 x 2 so suitable for larger stands only) are all included in the price. There are no hidden extras. 25 double complimentary passes to the Fridays Preview Evening. A hooks and wires hanging system is provided. Exhibitors can bring their own hanging system subject to agreement with the organisers. No nails are allowed. For full details or to book your exhibition stand email aberdeenartfair@btinternet.com. Selected exhibition stands do also come with the exclusive use of one outside wall which is free of charge but are subject to availability. Please note that measurements of the spaces are taken from the outside and do not account for the thickness of the panels, therefore the internal measurements of each back panel may be up to 10cm less. Also provided are – a wrapping stand / porters to assist with set up & take down / exhibitors cloakroom / handout containing exhibitor information. There will be a charge for entry by the general public into the show of £4 per person. You will be given 20 complimentary passes and 25 Preview Evening invitations to send to your best customers. The Preview Evening will be held on Friday from 6pm-9pm. As well as your own guests attendees will include sponsors guests, private and corporate buyers from the oil and professional sectors as well as buyers from our own database. Exhibitors are prohibited from piling art on the exhibition stand floor. All work must be unwrapped and hung on the walls. Work can be presented in exhibitors own browsers. Secure storage facilities are available. Prints on sale must be authographic prints – that is involving the “hand of the artist” in their production. Mass produced reproductions even if high quality ink jet (giclee) or screenprint are not acceptable. (Editions up to 250 acceptable.) Artists & photographers working digitally can exhibit ‘giclee’ prints but they must be of the highest possible quality using proven colourfast inks high quality paper and of a limited edition. A 20% deposit is required with your application, this will be offset against your full stall fee. If for any reason you choose to cancel, your deposit is non refundable. Cheques made payable to GM Events Ltd. If the event is cancelled we will return your deposit and stand fee in full but cannot be held liable for any additional expenses incurred. All stand fees must be paid in full by 1 July 2017. If payment is not received in full by this date, unfortunately you will lose your allocated stand and 20% deposit. You are responsible for your own insurance of your work, public liability will be covered by GM Events for the overall running of the fair but we advise that you still have back up. All artwork must be displayed within the confines of the exhibition stand. All work displayed must be for sale. No artwork deemed to be offensive in nature will be allowed. A few cards and postcards can be displayed and sold but must not dominate – 3 or 4 designs max. An artist can only be represented at one exhibition stand throughout the art fair and therefore cannot be exhibited at multiple stands. The Aberdeen Art Fair is presented by GM Events Ltd who have offices in Aberdeen and Glasgow and whose Director Gerry Muldoon along with his colleagues have been delivering cultural events in Scotland for 19 years. 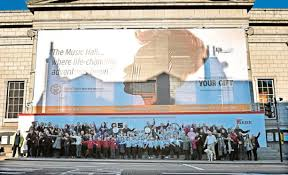 The company has a reputation for delivering successful events and have worked in partnership with many private and public sector organisations such as Scottish Enterprise, Aberdeenshire Council, Aberdeenshire Leader, Arts and Business Scotland and Royal Deeside and Cairngorms Destination Management Organisation. Aberdeen Art Fair will be backed by an extensive focused marketing and PR campaign that will bring together the discerning art buyer, the art enthusiast and the novice collector. Its worth remembering that the population of the North-East of Scotland is in the top three of the highest disposable incomes in the UK. With a buoyant economy that has a thirst for culture and a long standing tradition of producing great artists combined with a superb range of galleries and one of the finest art schools in the UK Aberdeen and its Aberdeen Beach Ballroom provides a perfect host for the Art Fair. Extensive PR and Social Media campaign using the services of one of Aberdeens leading PR companies, Prism PR. Extensive local advertising campaign including Press and Journal, Evening Express, West End Gazette, The Citizen and Northsound Radio. Why can’t I sell Giclee (Inkjet) reproductions? We want Aberdeen Art Fair to have and maintain a reputation for selling the best quality original artwork. We are very supportive of original printmaking and wish to exhibit many printmakers / printmaking studios. We feel that in the long term, exhibiting and selling reproductions undermines the event as a high quality national art fair, and in the short term confuses the public about what is and what is not an original print. How many hanging wires will be on the exhibition stands? What size will the table be on the exhibition stand ? The large exhibition stands only will be supplied with a trestle table which is approx 4ft x 2ft with a white table cloth, (if you don’t want a table just let us know). Please can you confirm when we can get access to the Music Hall? Access will be available from 12 noon – there will be a team of people to help you bring in your artwork. De-rig will be 5.00 on Sunday once all the visitors have left. Again there will be assistance to get your artworks out to your transport. Please just bear in mind that there are quite a few of you leaving at the same time so it may slow things down. We are aiming to have the Hall cleared by yourselves by about 6.30 – then the exhibition people will come in to dismantle everything. Storage of artwork during the Fair? There is secure storage facilities in rooms just metres from the main hall. You will be introduced to the head steward on arrival who will show you to your storage area. What labels can we use? You can use sticky labels as long as you take them off at the end. You can also use card/foamex labels stuck on with blu or white tack. What is the standard lighting? Our legal boffins ask us to point out that AAF my not be suitable for every type of artist/exhibitor and we therefore cannot promise or guarantee results in any way. If you have any queries on this please contact us. Free Childrens Arts Club on Sat/Sun.